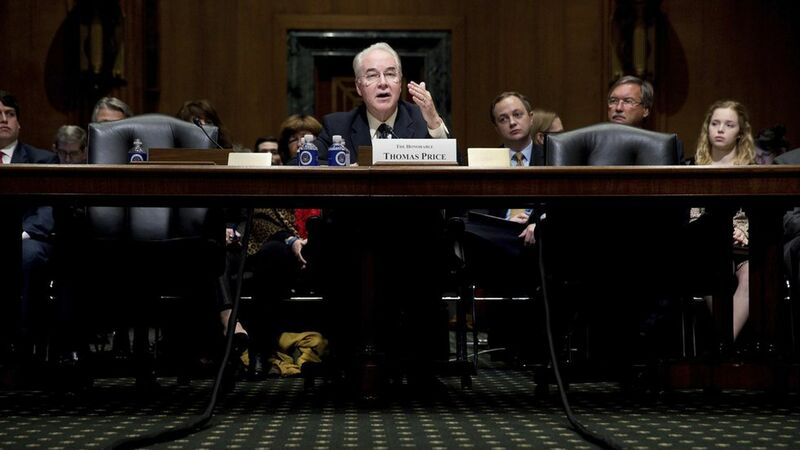 Health and Human Services nominee Tom Price suggested Tuesday he would keep implementing Obamacare until Congress passes and implements a replacement. "Our commitment is to carry out the law of the land," Price said during an exchange with Democratic Sen. Mark Warner about how he'd apply President Trump's executive order. He also declared that "a replacement, a reform, an improvement of the program I believe is imperative to be instituted simultaneously," when asked whether he'd use the executive order to eliminate the law's individual mandate. Between the lines: Price's answer was vague, and it doesn't mean he would do nothing to relax the law. There are a lot of executive actions he could take on his own, such as granting more waivers from the individual mandate. But Warner's question was whether Price would use the executive order to bypass the law completely — and Price has now made it clear that he won't do that. Yes, but: Price's statement won't answer all of the questions many still have about his intentions. ""It doesn't tell us anything about how the executive order will be implemented," said Larry Levitt of the Kaiser Family Foundation. "The real question is what, within the law, these agencies will end up doing."